It's too damn hot to be in the garden during the middle of the day but I find moments or shade enough to weed, plant new seeds, clip and generally keep on top of things, like ratty rosemary shrubs and salad vegetables that have bolted to seed. The garden has always been a personal space, though companionable weeding is always welcomed. 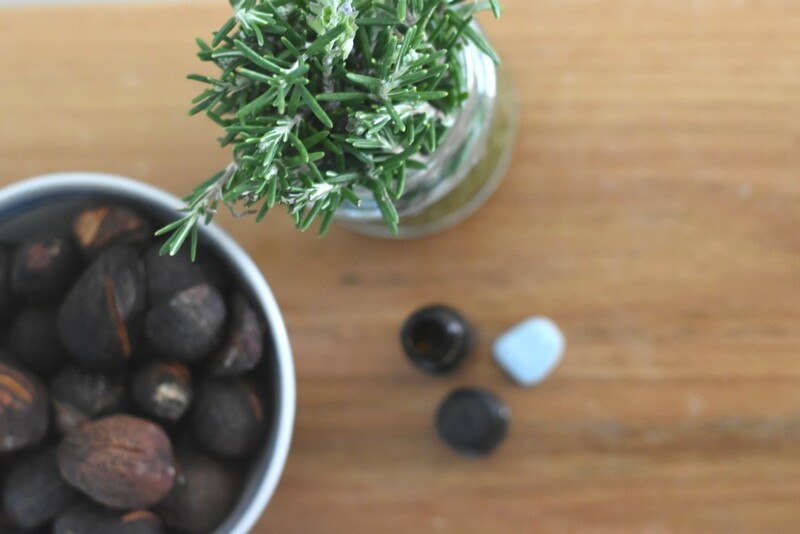 It's a source of pride to see new shoots or fresh blooms, or to pluck herbs and vegetables for a home-cooked meal. And, when it's too hot and humid to be outside, I can while away hours with my gardening bibles - mostly old Yates guides - for inspiration on what I should be looking ahead to plant or maintain. Among my collection of Yates Garden Guides is a 1944 edition that followed a publishing hiatus through 1941, '42 and '43 to reappear in "this climax year of the war". 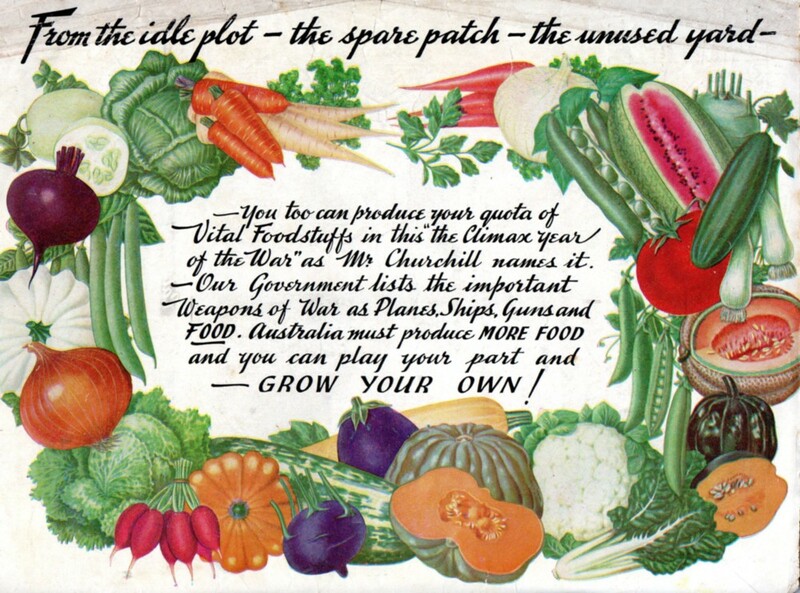 "Our Government lists the important weapons of war as planes, ships, guns and FOOD," it cries, and though I know depriving populations of their yield is a very old tactic of war, it's interesting to read the alternate "call to arms" of food production. In 2019, with a changing climate, I am pondering whether we need to "dig for victory" once more. Our arable lands and water catchments are under pressure and as home gardeners, I feel a need to grow, share and pass on my meager gardening skills. Over the past two years there have been a number of new produce swaps near me and I've seen many more turning and tilling their soil to produce food. I am a keen follower of the education in schools, as well as the various organisations supporting and guiding a new generation of gardeners. 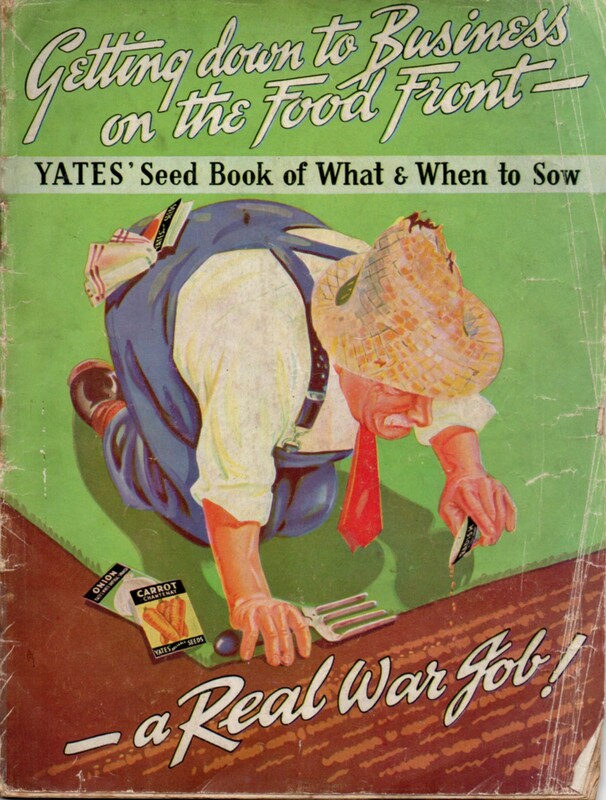 Back in 1944, the Yates catalogue called for an urgent increase in food production. 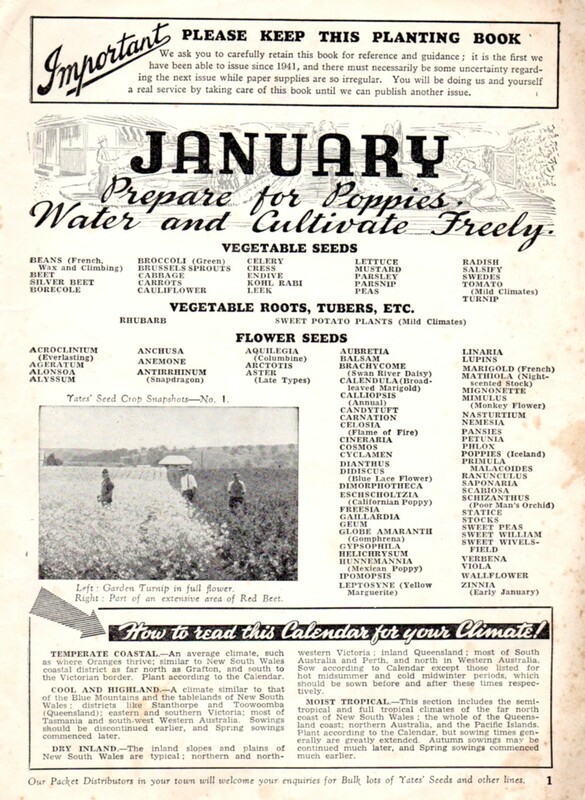 "The chief purpose of this catalogue," it editorialises, "is to back up the Government's campaign to vastly increase the home production of food stuffs; to get every home gardener to cultivate his own plot and, by producing at least some of his own vegetables, ease the tremendous strain on commercial production." Though the call was made to save commercial food production for the sustenance of Allied forces, perhaps the call needs to be raised again, this time for the sustenance of us all. I love these old books and guides Katie, so much practical wisdom that is as relevant today as it was back then.